Selecting the best yacht mattress shouldn’t be hard, especially since there are many quality mattresses on the market currently. However, knowing the right quality to select is very important. Below we will discuss some of the key elements that we take into consideration in ensuring that we provide you with top quality yacht mattresses. Why are foam mattresses the best option for boats? Innerspring mattresses pose a challenge while fixing in a boat as they are harder to install compared to the rest. If you need them manufactured in custom sizes, it would as well cost you more. Similarly, latex mattresses are costly no matter the size. This leaves us with foam yacht mattresses, which are way affordable, as they are typically delivered rolled up, allowing you to put them in place easily. You hence do not need an expert to do this. Consider choosing memory foam yacht mattresses which will offer you great spinal support and a plush feel. Remember however that the surface you place the mattress on has to be well ventilated, regardless of the type of marine mattress you choose. What are the measurements and shapes manufactured? We will be able to help you customize and design a yacht mattress that will fit and which will guarantee you several years of pure comfort. In this case, coming up with proper measurements is key. First, you should be able to take with the proper measurements of the inside of where the boat mattress will be placed, rounding off your measurements to the nearest lower inch. Avoid measuring the old boat mattress you are replacing as these tend to change in time. Remember also that when it comes to thickness, the marine mattress will be subject to thickness constraints of the bed – we can provide you with an 8’’ mattress or a 5’’ mattress based on your necessities. The fact that we use high-quality foams guarantees excellent sleeping comfort in both 5” and 8” thickness. Additionally, we produce boat mattresses in varying shapes. Notably, we have rectangular, one cut corner and two symmetrical corner mattresses which can easily be ordered online. 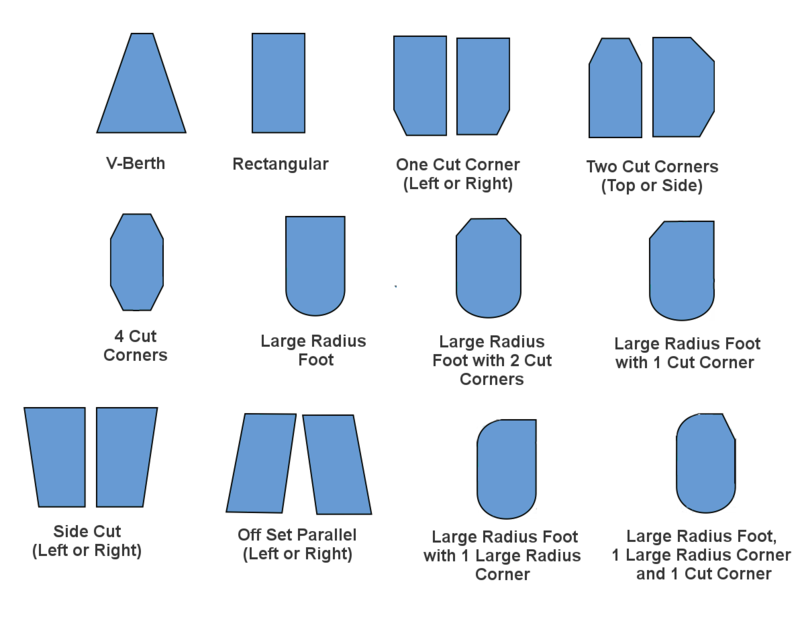 For the other shapes, you can submit the custom mattress order foam, and you will have your desired shape. Over the years we have supplied yacht mattresses for top boat and yacht brands such as Viking, Hatteras, Tiara, Cuisers, Carver, Princess, Sunseeker, Sabre, Grand Banks, Bertram, Marquis, Meridian, and many-many others. This entry was posted in Boating and Sailing and tagged Buying a boat mattress.